Transfer by coach from Avignon or Arles to Sète. Passengers are welcome to board our ship at 6:00 p.m. After comfortably settling into your cabins, we'll introduce our crew at a welcome cocktail before dinner. We'll leave on an excursion of the Etang De Thau, famous for its shellfish. We'll visit the Etang de Thau Museum, where you'll discover the shellfish farmers and fishermen, and you'll be able to taste some of the shellfish while taking in the beauty of the basin from a terrace. The afternoon will be dedicated to a tour of Saint-Guilhem-le-Désert, one of the most beautiful villages in France. After our visits, we'll return to our ship. We'll spend the morning cruising towards Palavas-Les-Flots. We'll cross the Etang De Thau, before joining the Rhône à Sète Canal. We'll arrive by late morning. This afternoon, we'll set out on a tour to discover a manade and the life of its herders. We'll travel by wagon and take part in a bull sorting. Before returning to the boat, we'll have a delicious snack with products coming from the farm. Tonight, take advantage of some free time and discover the spa resort of Palavas-Les-Flots, whose rich identity reaches back for more than three centuries. We'll spend the morning cruising on the Rhône à Sète Canal to Aigues-Mortes, arriving at the end of the morning. This afternoon, join us for a tour of Aigues-Mortes. This old, fortified city with a rich heritage is located in the middle of the marshes and is one of the most beautiful sites in Provence. We'll board a tourist train and tour the salt marches and visit the salt museum. After our visits, we'll return to our ship. We'll spend the morning cruising towards Gallician. We'll set out on an excursion this afternoon to the Camargue. Then you can enjoy some free time in the splendid city of Saint-Marie-la-Mer, where we recommend a visit to its fortified church. After our visit, we'll return to the ship by coach. 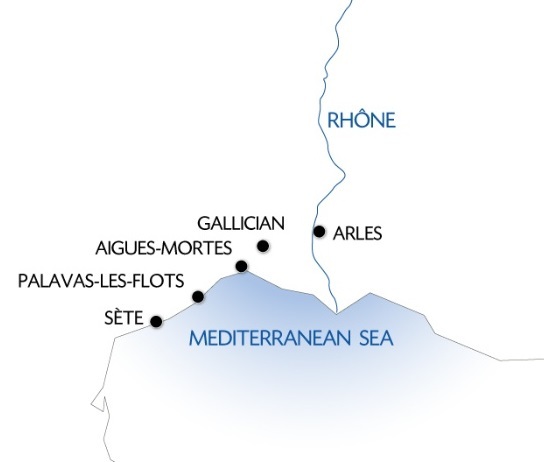 We'll spend the morning cruising towards Arles and travel on both the Rhône à Sète and Rhône canals. This afternoon, enjoy a tour of Arles. We'll discover this cultural center and its Roman ruins, and then travel inland to find out about olive oil production in Provence. We'll finish up our tour by tasting some local products. After our visits, we'll return to our ship. Tonight is our gala evening and dinner. From Sète to Arles, join us on a cruise through breathtaking sceneries. Discover the Camargue and Saint-Guilhem-le-Désert, one of the jewels of the Languedoc known as one of the Most Beautiful Villages of France. Visit Aigues-Mortes, a medieval fortified town with a prestigious heritage in the heart of one of the most beautiful natural sites of Provence. You will also have a chance to explore 2,500 years of history in Arles. (1) The stop in Sète may be replaced by a stop in Frontignan depending on weather conditions and the availability of suitable mooring points. (2) According to where the ship is moored, coach will be organized on board. A €20 additional charge will be requested at that time.